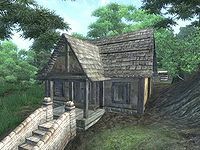 J'Riska's House is located in the southeastern part of Border Watch, just across the street from the town shaman Ri'bassa's House. Compared to his neighbor, Ri'Bassa, J'riska at least spends some time cleaning his house, even though it doesn't really contain that many items of interest. 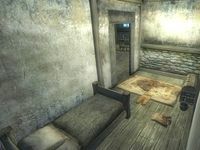 Apart from an impressive amount of tomatoes stashed away in a basket, the only two things worth noting are a potion of fortune inside a battered crate and the rare zero-weight beggar's shirt lying at the foot of the bed. 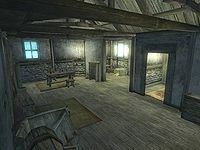 The rest of the interior is the usual clutter, pottery and spare clothing. This page was last modified on 8 July 2018, at 11:14.